The UN General Assembly held a high level meeting on nuclear disarmament on Wednesday last week (September 26) to commemorate the International Day for the Total Elimination of Nuclear Weapons. Presidents, prime ministers, foreign ministers and other leaders from around the world used the opportunity to promote key initiatives and measures for nuclear disarmament including the comprehensive nuclear test ban treaty, nuclear-weapon-free zones, de-alerting, no-first-use, stockpile reductions, the Korean peace and denuclearization process, the Iran nuclear nonproliferation deal, the recently adopted treaty on the prohibition of nuclear weapons and the global elimination of nuclear weapons through a nuclear weapons convention. However, apart from India and Pakistan, the nuclear armed States were noticeably missing from the meeting. 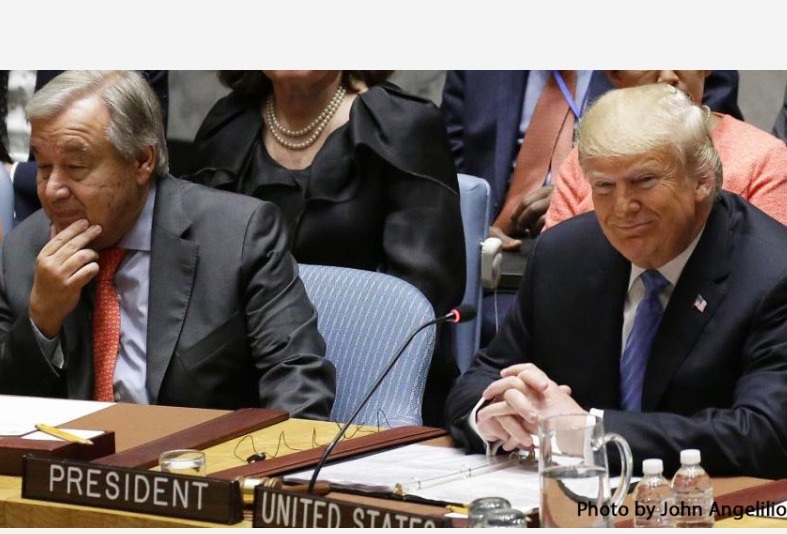 The P5 (China, France, Russia, UK and the USA) were instead down the hall in the Security Council chambers for a competing event on non-proliferation of weapons of mass destruction chaired by US President Donald Trump. Their absence from the High Level Meeting highlighted the fact that the P5 place very little priority on their obligations to eliminate their own weapons of mass destruction, focusing instead on preventing others from acquiring such weapons. ‘The United Nations and its member countries should focus more on disarmament for sustainable development’, says 18 year old environmental activist and youth leader Kehkashan Basu who was selected by the President of the UN General Assembly as one of the two representatives of civil society to address the September 26 UN High Level Meeting. ‘Our banks, universities, cities, pension funds and governments continue to invest in the corporations manufacturing and promoting the nuclear arms race for their own personal gain with no consideration for the ethics of investing in death,’ she said. ‘Civil society organisations, in cooperation with parliamentarians from around the world, have launched the Move the Nuclear Weapons Money campaign to cut the $100 billion annual nuclear weapons budget and reallocate these resources into the Sustainable Development Goals and other areas of human and environmental need. This includes direct cuts to nuclear weapons budgets, and divestment from the nuclear weapons industry. Already four governments and a number of cities, banks and investment funds have adopted nuclear weapons divestment policies.’ (Click here to read the full speech and see the video of Ms Basu’s speech). Ms Basu was also a keynote speaker at Youth, disarmament and sustainable devlopment, an international youth forum held in New York to commemorate UN Peace Day (Sep 21) and International Day for the Total Elimination of Nuclear Weapons. The International Day for the Total Elimination of Nuclear Weapons is held on September 26, the anniversary of the incident in 1983 when a nuclear war almost erupted by accident. On this day, the Soviet nuclear early warning center Serpukhov-15 detected ballistic missiles heading towards Moscow. Stanislav Petrov, duty officer at the time, reported a ‘false alarm’ despite the information, and probably averted a nuclear ‘retaliation’ from the Soviet Union. The story of this incident, and the follow-up visit by Stanislav Petrov to the USA 30 years later, is told in the award winning movie ‘The Man Who Saved the World.’ The movie was shown in a number of special screenings around the world to commemorate the International Day.